Lyme Bay Winery specializes in making traditional English recipes using modern methodologies. There’s few things more traditional than Sloe Gin, the old hunting beverage. Fortunately with a renewed interest in high quality cocktails, there’s been a renewed interest in this one maligned spirit. How does Lyme Bay Winery Sloe Gin stand up against the competition? Firstly, the gin: it’s a “London Gin” steeped with “whole fruits” and added sugar. “No concentrates or colors.” It is reduced to a strength of 26%. The color of Lyme Bay Winery Sloe Gin is amber with a reddish gold hue, almost leaning slightly more to the gold side of the spectrum. Tart plum in the top, rich pungent and over-ripe notes, these dominate with a rich full bodied Sloe flavor until the low notes where we can catch some hints of gin complexity on the edge. Robust and very fruit forward. Though on the nose, it seems less sweet at first scent than other Sloe Gins. The palate has some sweetness at first, with a juniper/coriander life that segues into rich, ripe berry. Berry in the middle, with the finish leaning rich, bursting cherry. Juniper, lemon, and a touch of angelica and spice in the low notes. Crisp and clean on the finish with a touch of lingering sourness and residual sweet. Well balanced and not overbearing, with a discernible gin character. With Ice, we found some reduced depth on the early notes and mids with a more dominant fruity character. Still robust and refreshing, but the depth was limited. First, let’s start with the most essential. The Sloe Gin Fizz with Lyme Bay Winery Sloe Gin was fantastic. Ripe strawberry, which when combined with citrus and the liqueur formed this rich melange of strawberry lemonade on the palate. Refreshing, crisp and bright. I really like this. It’s almost the platonic ideal of what this cocktail tastes like in my head. Recommended. Next I went for a cocktail I found doing some Google Searching and came upon the Ping Pong Cocktail. The odd combination of Sloe Gin and violet appealed to me at first. Violet dominated, but a little bit of lemon and some nice sweetness, followed by some rich plum. I mean, there’s an overwhelming chaos here and these things just didn’t work really well together. 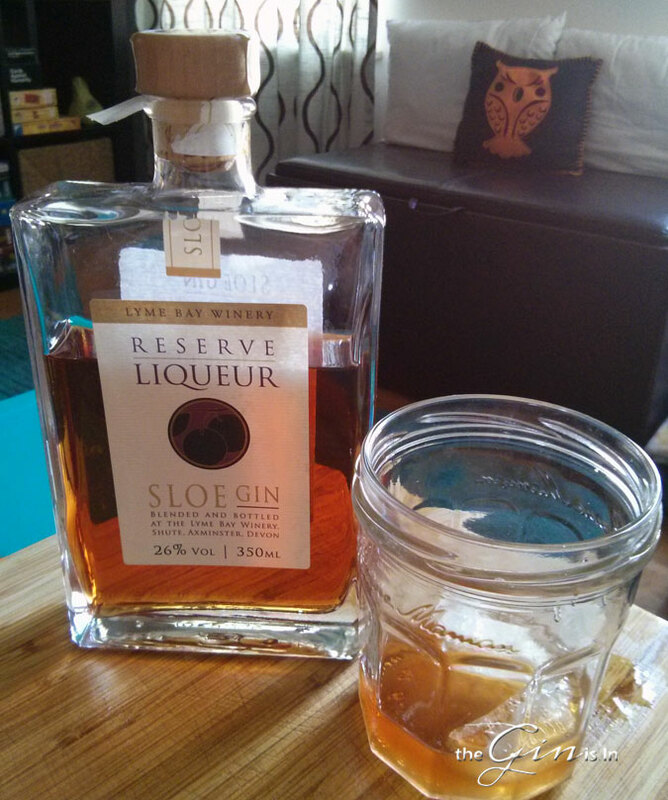 I’m not penalizing Lyme Bay Winery Sloe Gin for this cocktail. I’m not sure this drink really works. I’m going to pass on it in future Sloe Gin examinations. Back onto a different cocktail. And this one I think does work: the Blackthorn. (10:1 Sloe Gin to Sweet Vermouth, with a dash of orange bitters). Lyme Bay Winery Sloe Gin nicely compliments the Vermouth and vice versa, adding some herbal and bitter complexities to the sweetness that usually predominates. There’s a fermented bitter note on the finish that augments the berry, and all the while you still get a nice hint of juniper on the finish. Recommended. Finally we found a drink that was innocently called the Sloe Gin Cocktail. (equal parts Dry Gin, Sloe Gin, Dry Vermouth. and Sweet Vermouth). A study in contrasts in Sloe Gin if there ever was one. Although it adds gin, it’s still top heavy with notes from the Sloe Gin. Vermouth and bitterness is a bit heavier up front, leading into tart berry in the middle. Juniper, orange, and fermented fruit on the finish where you get this note of Sherry. Quite a nice cocktail, with a lot of depth and still very drinkable. A very nice, robust, rich, and not-oversweet Sloe Gin that works well in cocktails and on its own. A Sloe Gin that you can be proud to have on the shelf in your bar.